TO AVOID SERIOUS INJURY, Do Not Lubricate or Adjust the Trencher With the Engine Running. Remove the Wire From the Spark Plug To Avoid Accidental Starting. Periodically clean the entire machine of dirt, grease and debris build-up. Avoid high pressure power washing around the arbor shaft bearings. Damage will occur if water is forced into the bearings. Lubricate all pivot points with light machine oil. Periodic inspection should be done to insure that any worn bearings are detected and replaced. After every 2 hours of operation, grease the fittings on both arbor main shaft bearings. After every 20 hours of operation, grease the fitting on the front wheel yoke pivot. CHECK OIL LEVELS DAILY. Follow the engine manufacturer's manual for intervals of oil change, proper oil types, and fill levels for the engine and the gear reduction unit. All of the Following Lubrication and Adjustment Procedures Involve or Are Near Rotating Parts and Moving Parts. Always Follow All Safety Precautions and Wear the Appropriate Safety Gear. Do not under any conditions remove, cut, bend or change any part of the TRENCH'N edge. This includes all guards, shield, chutes and controls. Any change may make the machine unsafe to operate. Built in safety features are effective only when properly maintained and kept in place. Always inspect the V-belts for damage or excessive wear before attempting to adjust the clutch. For best performance, V-belts should always be replaced in matching pairs. The clutch can be adjusted to correct for V-belt slippage. Adjustment can correct for any normal V-belt stretch or wear. The clutch rod clevis ends are threaded and can be turned to increase the amount of tension on the V-belt. If some engagement or "creeping" is noted when the clutch is disengaged, reduce the tension on the V-belt. Also check the location and condition of the V-belt stop (located next to the engine pulley). The V-belt stop keeps the V-belt from "grabbing" or "creeping" when the clutch is in the disengaged position. The stop also keeps the V-belt from jumping off of the engine pulley when the clutch is in the disengaged position. If adjustment to the clutch rod does not stop V-belt slippage, the engine can be moved forward to increase V-belt tension. If the engine is moved to ajust the V-belt, the position of the engine V-belt pulley must be checked to ensure it is still lined up with the arbor pulley and the clutch idler pulley. Engine must be securely retightened afteradjustment. The arbor has four chucks, each holding up to two teeth. Carefully inspect each one of the arbor teeth for cracks, damaged tips, and missing retaining C-rings. Carefully inspect each chuck and each teeth holder for cracks, damaged, loose or worn attaching hardware, damage to attaching surfaces, or misalignment. Replace any worn or damaged components. Before removing teeth and chucks from the cutting arbor note the location of each part. Each chuck and holder has a specific location on the arbor wheel. The teeth are pointed in a specific direction in a specific order. All chucks, holders and teeth must be replaced in the correct position to enable proper operation. 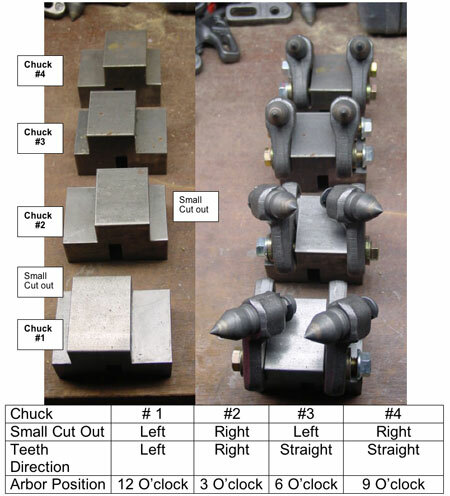 The following page illustrates the proper location and order for the 5" inch chucks. The arbor has four or eight chucks, each holding tooth. Carefully inspect each one of the arbor teeth for cracks, damaged tips, and missing retaining C-rings. Carefully inspect each chuck and each teeth holder for cracks, damaged, loose or worn attaching hardware, damage to attaching surfaces, or misalignment. Replace any worn or damaged components. Before removing teeth and chucks from the cutting arbor note the location of each part. Each chuck and holder has a specific location on the arbor wheel. The teeth are pointed in a specific direction in a specific order. All chucks, holders and teeth must be replaced in the correct position to enable proper operation. The proper location and order for the chucks can be obtained by contacting For The Edge, Inc. at ped@trenchnedge.com or 800-483-3437. To store the TRENCH'N edge over a extended period, clean all surfaces. Aviod high pressure power washing around the arbor shaft bearings. Remove any remaining dirt or debris from the arbor teeth and the inside of the arbor housing. 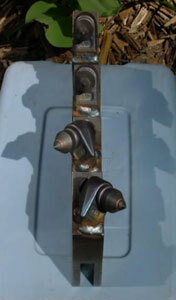 Apply a film of light machine oil to the arbor and the arbor teeth to control rust. Grease the fittings on the arbor shaft bearings and on the front wheel yoke. Remove fuel from gas tank and run engine until carbarator is empty. Prepare engine in accordance with engine manufacturer's directions. To return to service after extended storage, repeat the lubrication procedure. Check the engine oil level and refill the gas tank. Inspect the TRENCH'N edge for any damage which may have occured during storage. Correct any deficiences before returning to service. Arbor cutting teeth should be facing clockwise (teeth at 12 o'clock position should point to the back of the machine). The cutting direction of the arbor will be the opposite direction that you pull the machine to go forward. When reordering tooth holders, stand in front of machine (at the handle bars), the teeth that point right are right holders and the teeth that point left are left holders.